He was a member of the secret Revolutionary Committee, created by Vassil Levski, back in 1869. 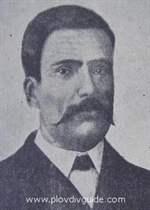 After the brutal defeat of the 1876 April Uprising, Dusho Hadjidekov was imprisoned, and after two years at the Tash Kapia prison in Plovdiv, he was slaughtered by the Turkish soldiers together with another 122 prisoners just hours before the liberation of Plovdiv. At the place where the Bulgarian prisoners got murdered today stands a monument - a large metal cross and a memorial plate, honoring the 123 victims.